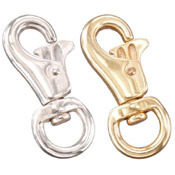 Heavy Duty Bull Snap, available in nickel or solid brass. This the same snap used by top trainers. This is the real thing, NOT a cheap knock-off.